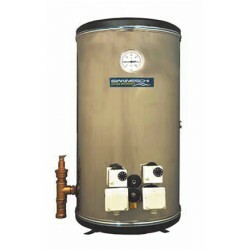 Water Heaters | Exalto Emirates LLC. 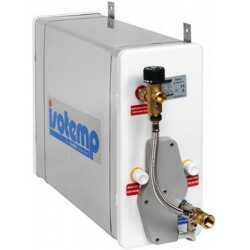 The Isotemp water heater comes with brushed stainless steel cover as well as innovative internal design. It achieves highest capacity by optimised installation of the engine water heat exchanger as well as the immersion heater. They are positioned in the lowest part of the tank where the water is coldest in order to ensure an equal heating of all the water in the tank. The water in and outlets are especially designed to minimize the mixture of cold and hot water. Extra long, corrugated coils for high heat exchange efficiency Special 7.0 bar/100 psi safety valve Simple winter drain Ultra-thick insulation for lowest temperature loss Electrical plug and play immersion heating element, especially designed to heat also the water at the bottom of the tank Thermostat mixing valve comes as standard. Immersion heating element available in 750W as standard. Water tank &amp; External cylinder in SS 360&deg; only mounting for easy installation on bulk head. * Including thermostat mixing valve;** Immersion heater 115 V/750 W also available. 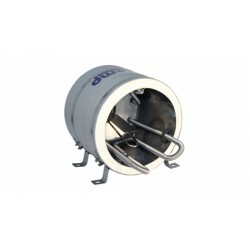 Material: Tank, engine water coil and all connections S/S AISI 316; Outside cover and mounting feet: S/S AISI 304; Electric immersion heater: Copper covered by Nickel; Insulation: Polyurethane; Water connections: 1/2&rdquo; inside and outside NPT and BSP pipe thread. Changes of the specification may be done without prior notice.